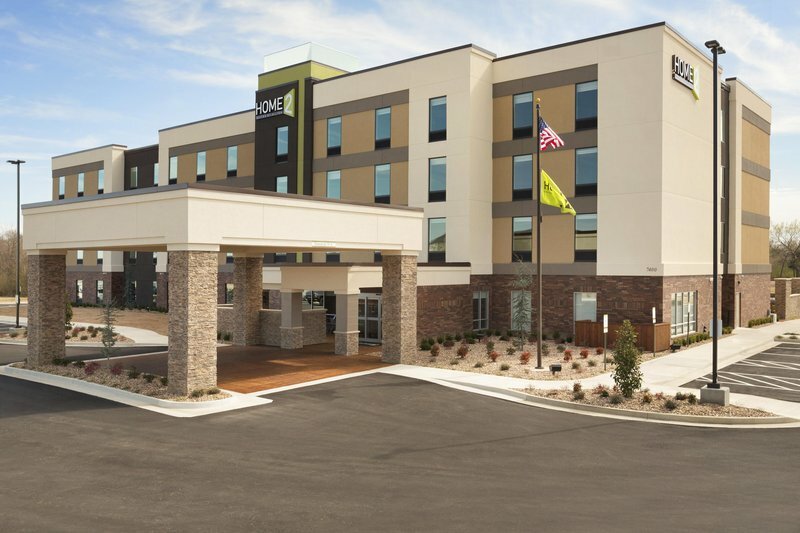 Welcome to the Home2 Suites by Hilton Fort Smith. Conveniently located near Fort Smith Airport with easy access to several restaurants shops and corporate businesses this modern all-suite hotel is perfect for both families and the smart savvy business traveler. Parrot Island Janet Huckabee Nature Center and the Museum of History offer nearby family fun while the Old Fort Days Rodeo and Wakarusa Music Festival are just two fantastic annual events held close to our Fort Smith AR hotel. Make yourself at home in our stylish studio and one-bedroom suites. The kitchen comes complete with a microwave dishwasher coffeemaker and full-sized refrigerator. Stretch out in front of the 42-inch flat-screen HDTV and stay connected with free WiFi in the media/work space. We offer a free hot breakfast every morning of your stay at our Inspired Table. After a productive day unwind in the outdoor patio/grill area with fire pit swim lengths of the indoor pool or put a wash on while you work out using the combined laundry/fitness facility Spin2Cycle. Our tranquil Oasis lounge area is the ideal environment for socializing or a casual meeting. Plan a conference or group meeting for up to 12 people in the boardroom. *One of the top steaks in America. * Food Network presents Bon Appetit magazine*s best picks for American eats. If you need a place with plenty of TV*s to catch the big game or just want a place to relax with friends Grub*s Fort Smith is the place for you. A New York Style full service Delicatessen nestled in the heart of Fort Smith AR. - Fort Chaffee Maneuver Training Ctr.